Let's Go Cooking in Europe - Project Legocie LEGOCIE project encourages and facilitates adults to share knowledge and good practices about cooking skills and healthy eating in European countries. Another succesful meeting with partners. In the beautiful city of Coimbra from October 2 to 6 the partners discussed food events that were done in summer and those that are going to happen soon in other countries. we are happy to annouce one of the project "Food Events" organized by one of the partners - organization RESTART in Slovakia was a big success! It was organized as two part workshop of "Healthy eating" at the local Children Summer University organized by KAMARAT freetime activity center in cooperation with Jessenius faculty of Medicine, Commenius University on Tuesday and Thursday this week. 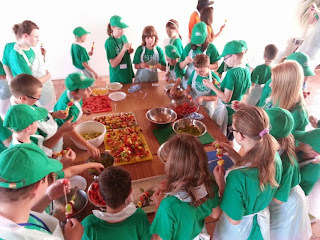 Since earlier in the project we learned from the questionnaire that fruits and vegetables are not that often on our plates, we decided that as a part of promotion of healthy cooking and eating we will together with the children prepare fruit desert - pieces of fruit on stick and "Balkan salad" as sidedish for Thursday's lunch. On Tuesday we prepared several stands with different types of fruit: strawberries, apples, bananas, oranges, pinaples, grapes and water mellon. 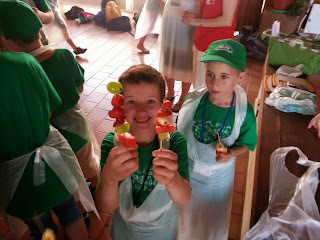 Older children were peeling and cutting the fruit and younger did put it on a stick. 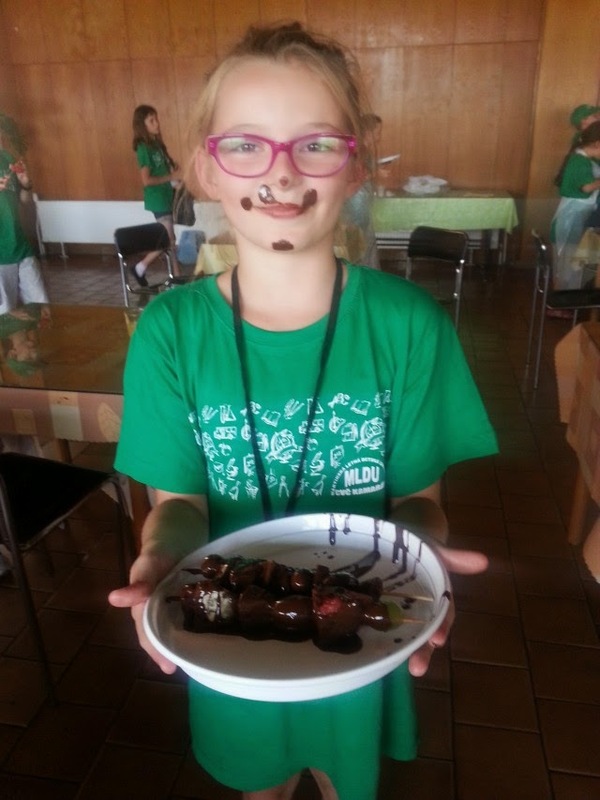 It was only after the lunch when they were allowed to take fruit on sticks and cover them by nice dark chocolate in a chocolate fountain. 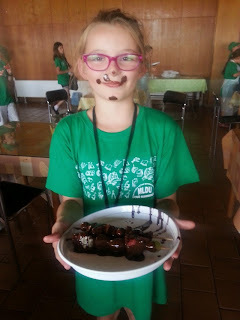 For those of you that cannot see connection of chocolate with health, this was high percentage pure cocoa, dark original belgian chocolate, which contains many healthy minerals and micronutriens - in limited amounts is important for children development. On Thursday, during the second "Workshop of healthy eating" the children participated in preparation of sidedish for the main course of the lunch. They peeled and chopped vegetables and fresh goat cheese and made "Balkan Salad". Though it was obviously not as popular as fruit with chocolate, they were happy to see how they are appreciated by other groups of children that enjoyed the lunch. After the salad was made we still had some time to discuss various eating and cooking habbits of different nations: we spoke about Italians, Greeks and Turkish as southern countries with small breakfast and big dinner, UK lunch of soup and cheese and other specifics of another European cuisines compared to our Slovak way of cooking and eating. The children enjoyed it very much and we are happy we could be part of this great event. We wish you all healthy week! The end of May was in Italian colors. All partners traveled to Milan and then just a little but further to Somma Lombardo, where we had our 3rd meeting. The meeting in Cyprus was a fantastic opportunity not only to meet everyone involved in the project again, but also to explore some of the most beautiful places in the country. We were based in Platres, up in the mountains, which had formerly been a base for the British military in Cyprus. It was funny to see traditional English post boxes, but coloured yellow, not red! From our base in the Troodos mountains we were able to explore many places of interest. 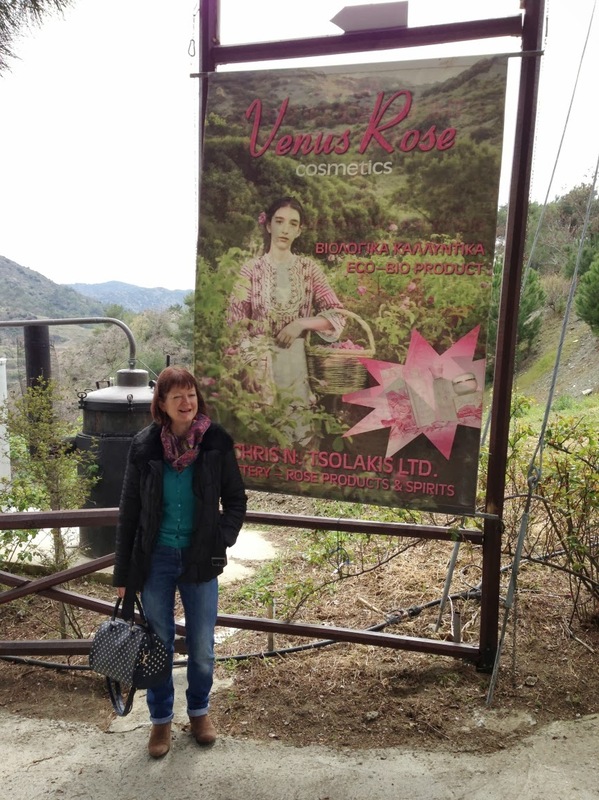 Here I am at the rose cosmetic and fragrance centre. It was too early in the year for the roses to be out, but we could smell the perfume and taste the rose liqueur! and sample plenty of amazing Cypriot food. 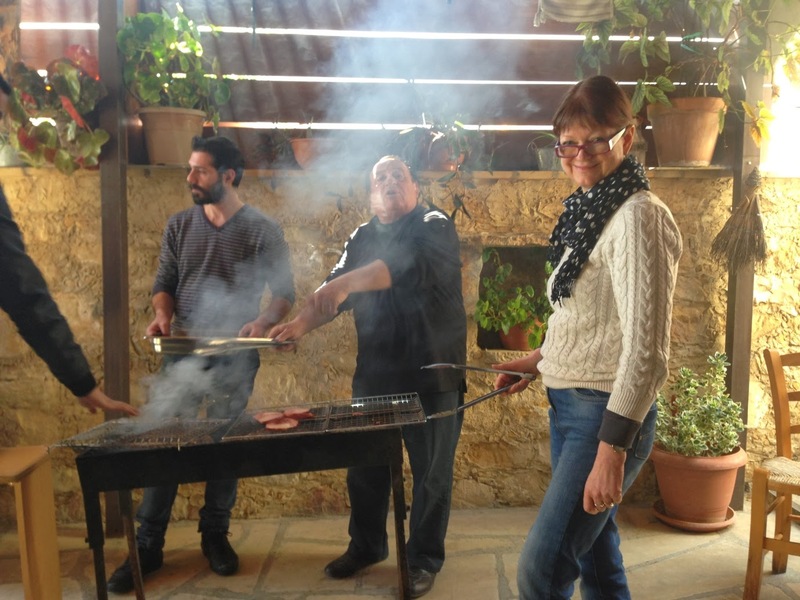 Here I am “helping” to cook the lunch at a traditional taverna in Vouni village, famous for its wine making and now home to a brand new Wine Centre, which we also visited and where we tasted a range of local wines – it’s a hard job, but someone has to do it! Throughout the visit we experienced fantastic hospitality from our hosts, Panayiotis, Christos and their colleagues, but despite all the visits and fabulous food and drink, we got plenty of work done too. We all made presentations about our national foods and the healthy eating initiatives that are currently running in our countries. We also planned our next meeting and agreed on a plan of action together so that we can all build on the knowledge and experience we have gained. Welcome by Panayotis and members of tourism board of Cyprus. Dear friends! 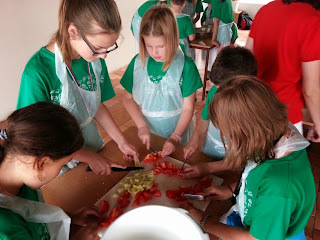 Welcome to the blog of project Let's Go Cooking in Europe (LEGOCIE). This project is devoted to investigation of various ways of preparing national healthy meals and food. After successful application in 2012, 10 partners started preparations for the first meeting. The coordinating organization Accentuate from Northern England invited us to Newcastle upon Thyne, beautiful city with 7 bridges in the North of UK. This was important getting-to-know-eachother meeting, since not all partners were acquinted before. The accommodation was chosen based on suggestion of leading partner and was great, right in the city center. Despite early morning false fire alarm we were ready to meet Stewart, who together with Sarah that we met later are behind the initial success of this project. They prepared very nice cooking session right in the start of the first day! We cooked our typical UK lunch - soup (actually 3 kinds) that was served with selection of the finest bread and cheese. 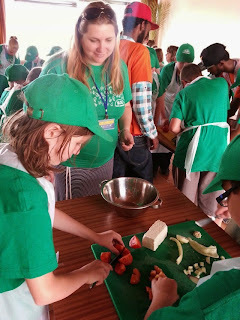 Many partners already showed their deep cohesion with kitchen equipment and supported by fantastic recipes of Sarah and .... we all had lovely lunch. In the afternoon we started with each partner's presentations and official programme, that was prepared in detail by the hosts. The programme continued also the next day by visit of the Angel of the North and Beamish museum, where one could see in person about hard life of people from early industrial era. Following the museum visit was very nice dinner near the river Thyne, where we stood in amazement while Stewart told us stories about the bridges of Newcastle. On the third day of the meeting we went to Blackfriars restaurant, where local restaurant owner Rick offered his offices where the remaining partners succesfully finished presentations about their countries and organizations and also negotiated and prepared activities to be done before and on the second meeting. After just few days all partners started to feel comfortable and found common wave of common understanding. Preliminary dates for next meetings in Cyprus, Slovakia and Greece were planned. Final visit of original UK football match among Newcastle - Bruges was the cherry on the top of the meeting. I have to say it was perfectly organized, with all important information sent ahead, full programme and also sufficient amount of hard work that started very successful cooperation of all partners. Thank you Stewart and Sarah and people from Accentuate, you did a great job!